I left Perth on March 21st, the spring/fall equinox (depending on your hemisphere of choice) to start my second season of “fieldwork” for my PhD studying the Endangered pygmy hippopotamus. I use quotations as working in a developed country with electricity, running water, telephone and internet connections is quite a different experience than working in the rainforests of Côte d’Ivoire the previous year. The term “fieldwork” generally conjures up the image of someone getting up at the crack of dawn in a remote (and often dangerous) location, working 12 to 16 hour days (or nights), and suffering through some less than desirable circumstances of nature (extreme heat, cold, rain, wind, poisonous snakes, etc.) in order to collect their data. I will also be working outside quite a bit during my data collection in the USA, and although considered a developed country by most criteria, the USA does have its share of less than desirable weather (hurricanes, tornadoes, earthquakes, massive snow storms) as well as an impressive collection of venomous snakes (although not as many as in Australia). Thus, let the fieldwork begin! My first month has been spent in Florida, which (surprisingly) contains the most pygmy hippos of any area outside of their native habitat in West Africa. However, it may not be so surprising after all, as Florida’s subtropical climate exhibits many similarities to the climate of the West African rainforests. Both regions have distinct wet and dry season; total annual rainfall amounts and seasonality are nearly the same; light cycles (hours of daylight/darkness) are analogous; humidity and average temperature are comparable; (native) vegetation is similar. In fact, a close analysis of the Studbook, a record of all pygmy hippos in captivity throughout the world, shows a higher concentration of this species and a greater breeding success for equatorial or subtropical regions through the world; West Africa; Florida; SE Asia (Indonesia, Thailand, Sri Lanka, Malaysia; Singapore). Although it may seem like common sense, sometimes simple things like housing animals under environmental conditions similar to those they would experience in their native habitats equates to healthier captive animals. My research with the captive pygmy hippo population will study the health, physiology, stress, reproduction, and genetics of this animal throughout the USA. I am working with each zoo or private facility to evaluate husbandry practices, feeding, diet, management, and to collect data on hippo health and hormone levels. Hormones change constantly in the bloodstream, and metabolic processes throughout the body break down these hormones (primarily in the liver and kidney) and these metabolites are then excreted in the dung, urine, and saliva. 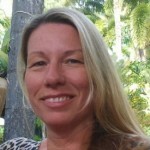 In hippos, hormone metabolites may also be lost from the body via their unique foamy skin secretions which serve an antibacterial and “sunscreen-like” function. Since dung samples are logistically the easiest samples to collect from an animal without direct handling or changing husbandry routines, I will be looking at reproductive and cortisol (stress) hormone metabolites in dung samples collected over time. Me collecting dung at Rum Creek Ranch, here you go! What does this mean in simple terms? 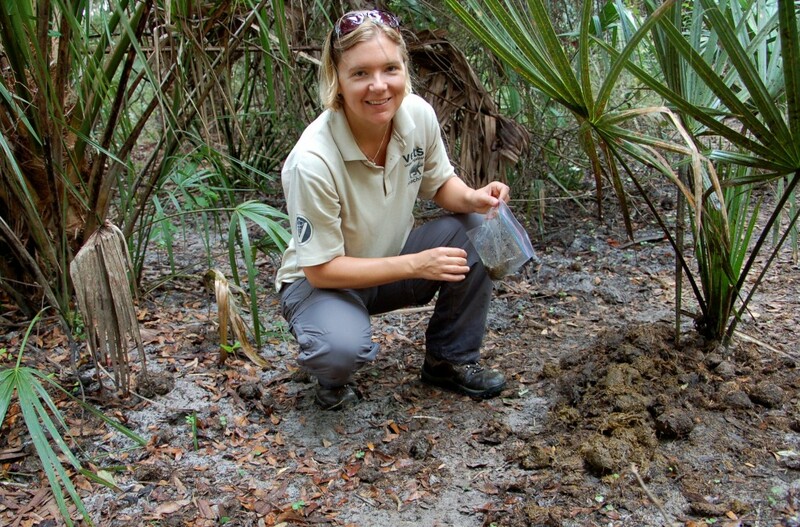 Picking up pygmy hippo poop! Dung samples are stored frozen in air-tight baggies and later will be analysed at a veterinary laboratory that specializes in extracting hormones from the dung of various wildlife species.Although poo-collection may not seem like a very glamorous way to study an animal, it allows the researcher to determine many pieces of useful information without having to bother or stress the animal with things like restraint, anaesthesia, and blood sample collection. Although urine is another useful bodily excretion for hormone analysis, I don’t think anyone has gotten around to training their pygmy hippos to pee in a sample cup. And if you try and stand behind a hippo when it urinates to collect a sample, you will get very wet and messy as the hippo spins its tail around like a propeller to spray a soupy mixture of urine and dung (this is thought to be a form of territory-marking behaviour). 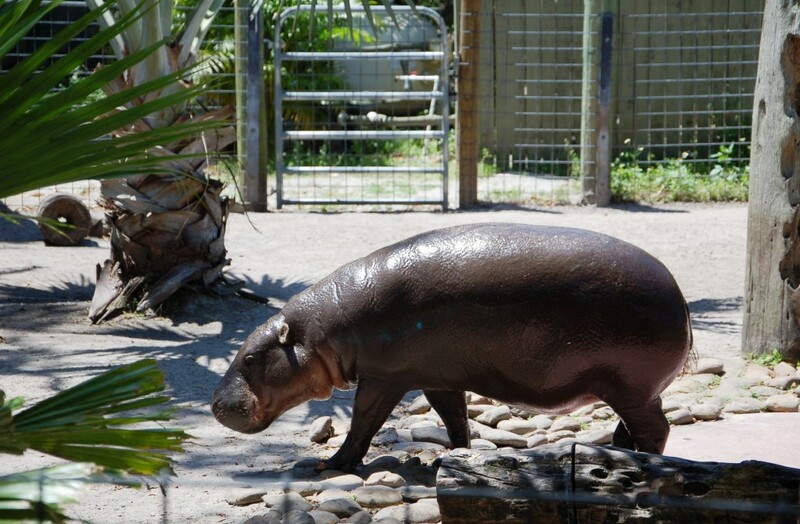 There are four facilities in Florida with pygmy hippos: Zoo Miami, Tampa’s Lowry Park Zoo; Giraffe (not Hippo) Ranch near Dade City, and Rum Creek Ranch. 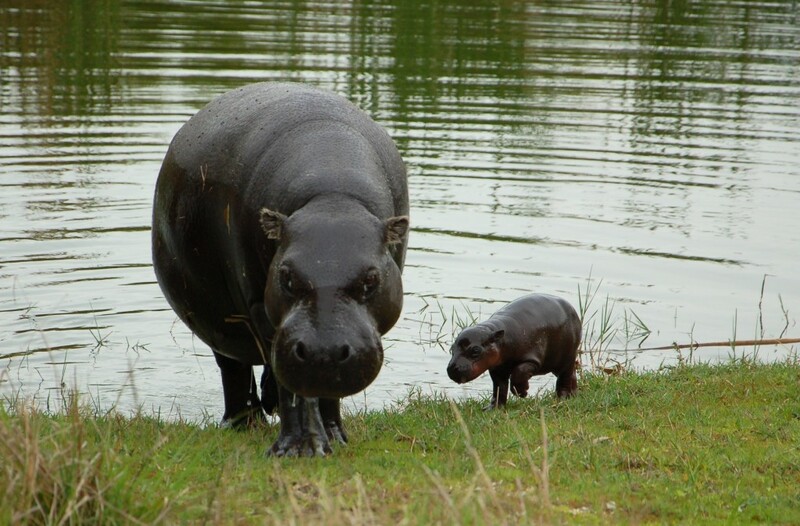 I started out at Rum Creek Ranch, a privately-owned breeding facility in central Florida with more than 30 pygmy hippos. They are not open to the public and they do not function at all like a zoo; their animals are all housed on large plots of land and managed in a hands-off fashion. The hippo areas (they have other tropical Endangered species, too) all contain a large shallow pond, open grassy areas, and areas with natural dense vegetation cover that to me looks very similar to pygmy hippo habitat in the West African rainforests. However in Florida the hippos share their space with roseate spoonbills, red-shouldered hawks, wild pigs and American alligators instead of the African pied hornbills, black-shouldered kites, red river hogs and West African dwarf crocodiles of the Upper Guinean Rainforest ecosystem. The pygmy hippos at Rum Creek Ranch all look healthy and svelte; unfortunately a large number of common and pygmy hippos in zoos are overweight, an affliction of many captive species. Because Rum Creek Ranch does not have to house their animals in a viewer-friendly manner as they do not function at all like a traditional zoo, the pygmy hippos hardly ever have any human contact. The animals are also allowed to graze and forage on natural vegetation; they receive a very limited amount of supplemental feed. They also live a solitary existence except during breeding, which is thought to mimic the natural ecology of wild pygmy hippos. Thus, given that Rum Creek’s pygmy hippos are housed under extremely similar climatic and ecological conditions to their natural habitat and are also managed in a hands-off manner, these pygmy hippos are likely the most representative of the “wild” population that one can find in captivity. Hopefully studies of these animals will help improve our understanding of the natural physiological processes of wild pygmy hippos in areas like the Taï National Park in Côte d’Ivoire, and furthermore will provide a baseline of hormonal and genetic data that can then be applied for ongoing in situ conservation research. Giraffe Ranch is also a privately owned facility holding many different exotic tropical species, but it is open for private tours five days per week; they have one pair of pygmy hippos as well. 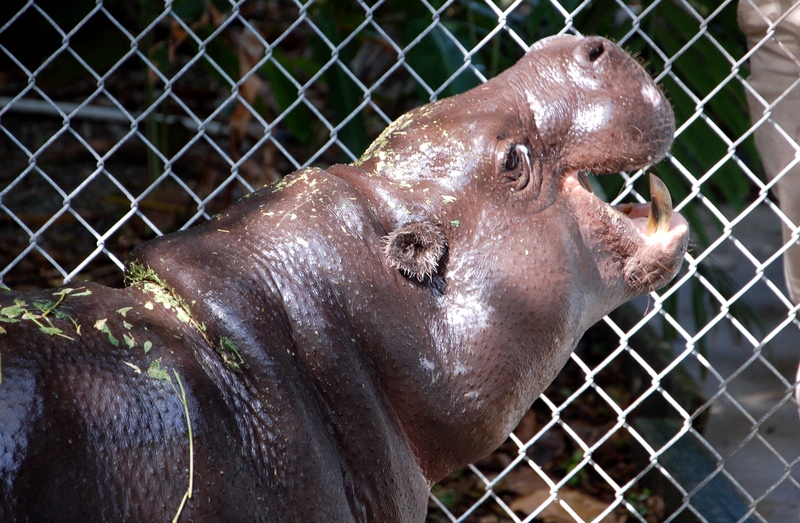 Both Zoo Miami and Tampa’s Lowry Park Zoo have one breeding pair of pygmy hippos and a juvenile calf. I met with the animal keeping staff at all of these places to discuss the goals of my PhD research, their hippo management and husbandry, and the protocols for collecting dung samples and storing them. 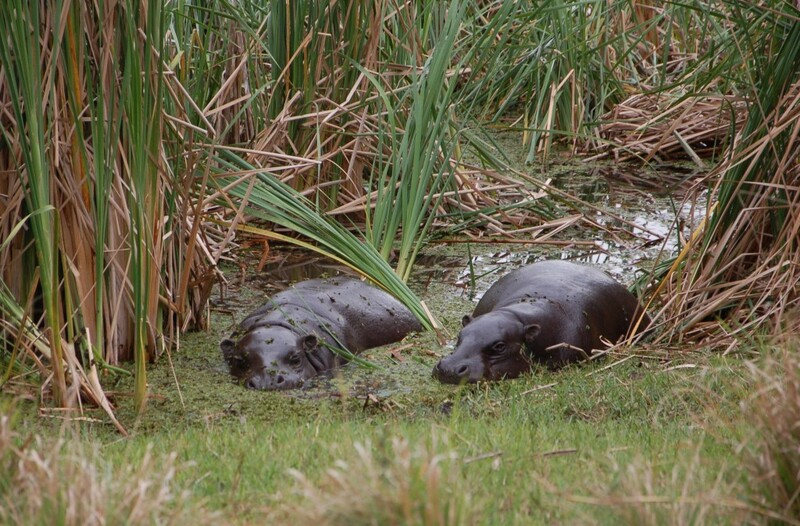 And of course I also took advantage of these opportunities to take many photographs of the pygmy hippos themselves. Photos will be used for comparing the body condition of animals at various facilities, and to chronicle different enclosures and housing designs. And of course the photos also document the unique, endearing features of each pygmy hippo. I have also already experienced the full spectrum of the subtropical Floridian climate since my arrival as March/April is the beginning of the rainy season. In addition to sweltering hot humid days with temperatures over 30oC we have also had numerous torrentially drenching rainstorms that rival what I experienced in Taï National Park, Côte d’Ivoire. During my travels across Florida I also had an opportunity to spend a day in the Everglades National Park, one of the world’s largest natural wetlands. The birdlife is incredibly diverse and plentiful, ranging from herons and anhinga to egrets and red-winged blackbirds to storks and osprey. 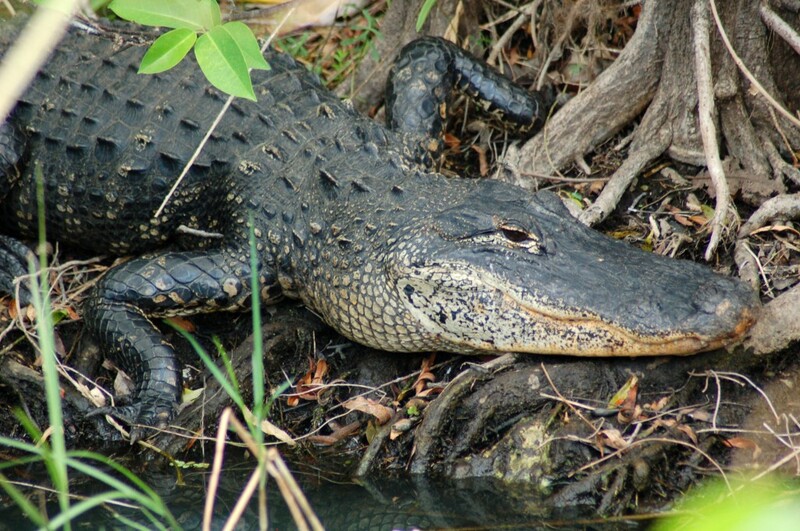 The Everglades are also home to numerous endemic mammalian species such as the Florida panther and the Key deer, and of course the most famous Floridian animal, the American alligator. In late April I will embark on the next leg of my pygmy hippo research journey, traveling overland to most of the zoos with pygmy hippos in their collections: Montgomery Zoo in Alabama; Louisville Zoo in Kentucky; Chicago’s Brookfield and Lincoln Park Zoos in Illinois; Omaha’s Henry Doorly Zoo in Nebraska; Brownsville’s Gladys Porter Zoo in Texas; Baton Rouge Zoo in Louisiana; San Diego Zoo in California; and the Oklahoma City Zoo where the only remaining wild-caught pygmy hippo living in the USA resides. His name is Wolee and he was imported from Liberia in 1974, meaning he is at least 40 years old! I am looking forward to meeting all of these pygmy hippos and learning as much as possible about the husbandry of these animals from the various zoo keepers, veterinarians, and animal managers. Working as a collaborative team, we will gather a multitude of data that will greatly improve our understanding of this species’ physiology and health.